I completely forgot to add this to my weekend list of randoms, but it is so much more worthy of its own post. We had a post-op visit with our orthopedic surgeon last week and were thrilled to find out that Jack never has to go back and see him again, his first graduation of sorts! Since Jack’s surgery in November of 2010, we’ve gone back to our doctor for regular checkups (a doctor I was amused to learn, is very interested in hand injuries from the Civil and World Wars and has written books and articles on the subject), not knowing if this would be our last or not. Each time we’ve gone, we did x-rays and the doctor checked out his hand and said everything looked great, no surprises. This time was no different and we were pleased to learn it would be our last and unless Jack ever needed a special orthotic for his hand (say if he were interested in playing baseball or golf on a very competitive level) or injured his hand in some way and needed it checked out by a specialist. I briefly mentioned Jack’s surgery in my post about Liam’s belly button surgery, but I thought it might be helpful to someone else if I recounted in more detail the operation we opted to have for Jack because of his symbrachydachtyly on his left hand. 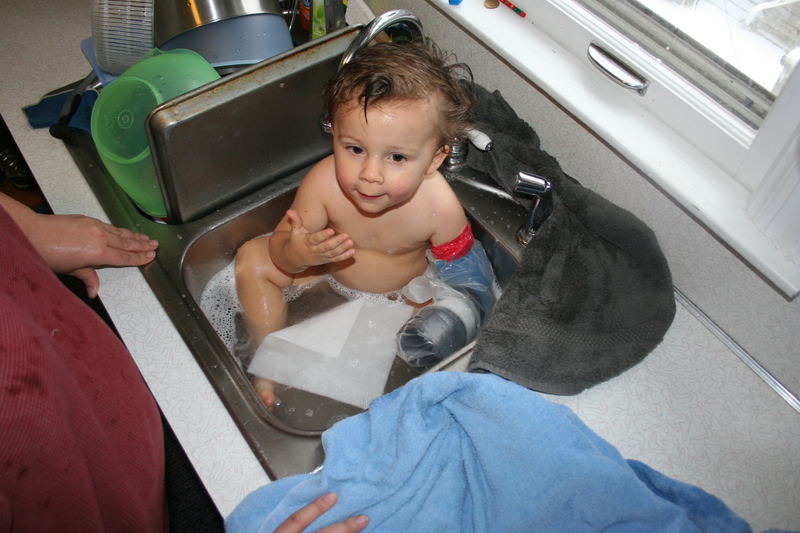 Shortly after Jack was born, we were referred to a hand specialist for a consultation to learn more about Jack’s hand and what options we might have in the future. Prior to this meeting we’d already figured out that it was called symbrachydachtyly and that it is found in 1 in 30,000 births and starts around 5-6 weeks gestation, for an unknown reason – it is inexplicable and there was nothing we did to cause it and nothing we could have done to prevent it. Our doctor was impressed that we knew what it was called (we are Google professionals) and we were impressed that he said all the right things regarding it not being the fault of anything we (I, as his mom) did and that we would find there was truly nothing he wouldn’t be able to do. We quickly determined that we weren’t there for consolation but rather to learn what we could do to improve things with his hand since growing a complete one wasn’t an option. Jack’s thumb had the end bone (at the tip, under his nail) but no middle bone to attach it to his hand. He also has the first bone in his pinky, but no actual finger around it. Having these two things gives him an opposable grip. His other fingers were actually what the doctor referred to as nubbins, little “bubbles” of skin without bone that were attached to the end of his hand without much base (like a skin tag), though they did have tiny little finger nails on them. There were a couple options, one of which was a complete toe-to-hand transplant, which is better-suited for people who didn’t have any digits on their hand and another which was called deepening where they cut into the bone on his hand and create a deeper “v” between the thumb and pinky to give him better grip. They could also lengthen one or two of the bones in his hand using a long process and contraption that would slowly stretch/grow the bones out – very painful and again, more beneficial for someone without an existing grip or digits. The final option he described appealed to us most and was the one I think we knew we would go with from the beginning, included a less invasive bone transplant (not a whole digit transplant). Because of the missing bone in his thumb, Jack’s thumb did not have stability to give him a tight grip. He could pick things up with his hand, but if you applied any pressure, he would drop whatever he was holding. Our doctor explained that we could take a bone from one of his toes and insert it into the place of he missing bone and stabilize his thumb, this would give him the best chance at having a tighter grip – bingo! He did note that it would not increase mobility, in other words, it wouldn’t bend like a regular finger at the upper knuckle. Once we decided on the surgical route, we just had to wait until Jack was at the right age to do the surgery (post-crawling and frequent falling down) but prior to school when the surgery would be more disruptive. 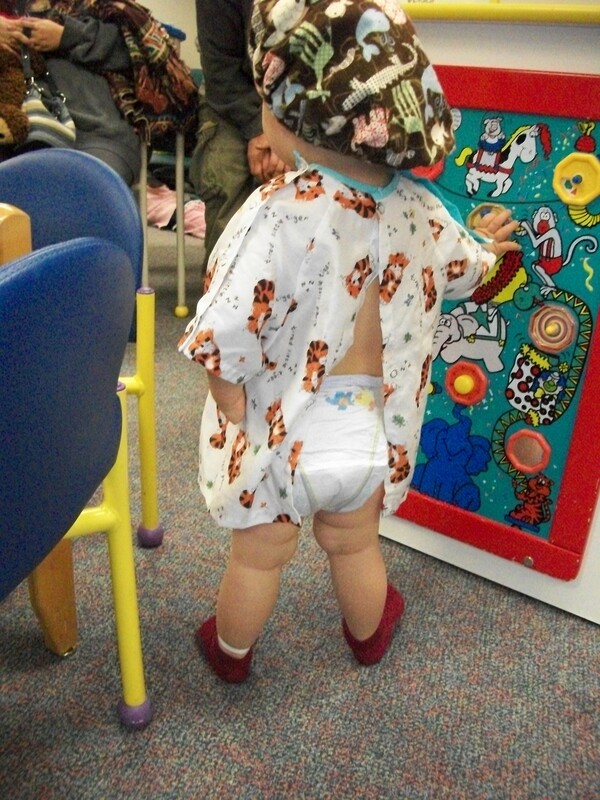 The day of surgery came and we got checked into the hospital with a slightly cranky nearly-two-year-old who hadn’t been able to eat that morning (this was in the days where he at all of the things, prior to his current picky food eating ways). He really had no idea what was in store for him and you can’t explain something like that to someone his age so we just prayed that all went smoothly and that he would not be scared at any point. We went to pediatric pre-op where my friend Stef’s husband (an orthopedic surgical resident at the hospital) found us and said hi – we had hoped he could sit in on the surgery, but it didn’t work out. They gave us some sleepy meds for Jack to take – not surprisingly he did not fall asleep (unlike the other child who was also there waiting) so the anesthesiologist came and got him and ended up carrying him back to surgery while he waved groggily at us, leaving us there in the waiting room (I will tell you that was almost the hardest moment in this whole process, but God did protect our hearts and give us peace that we were doing the right thing). Once the surgery was done, we got to go to recovery and see Jack, who had woken up and was very out of sorts but he calmed right down in my arms and cuddled for the longest he has ever cuddled in his life (apparently he just needs pain meds and surgery to want to be held for more than 10 minutes; also, a tooth being knocked out does the trick as well – I will happily avoid both as long as I can, despite my love of cuddles). After a couple hours of recovery, we were sent home and Jack was eating and back to his normal, happy self that afternoon. Albeit, his self with a large, tube cast from mid-upper arm, past his finger tips (hand casts usually wrap around a thumb to stay in place so Jack’s had to go a ways past his elbow to ensure that it would stay on). 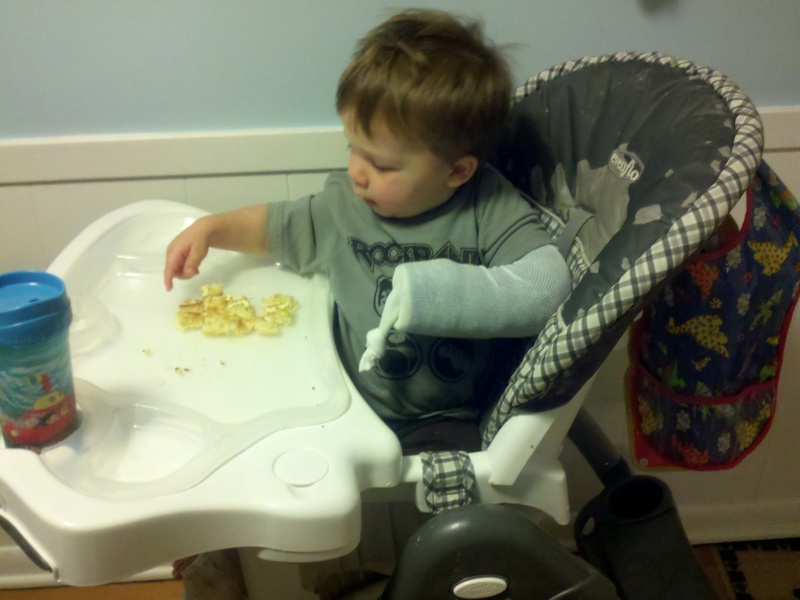 He also got a handy “sock” to cover the end of his cast so he didn’t pull out the stuffing around his hand. We “enjoyed” the cast for six weeks, letting Jack live in the two borrowed-from-his-brother sweatshirts that would fit over his cast and didn’t look huge on his little body. A plastic cast cover and packing tape were enlisted for his very infrequent baths (I laugh when I think of how we must have looked during that time frame, one particular Meijer trip he looked quite fetching with his cast, dirty shirt that he’d spilled orange pop on just before we left, a face smeared with chocolate from the free cookie from the bakery and some serious bed head from a lack of baths. Alas, this is why I don’t judge people at the store.) But otherwise, it was business as usual, not at all bothered by the large plastic mass on his left arm. His toe, where they harvested the bone, was a little more bothersome but only until the stitches dissolved (I will spare you a picture of that because it wasn’t too pretty as you’d imagine when they remove a bone from the middle of a toe). 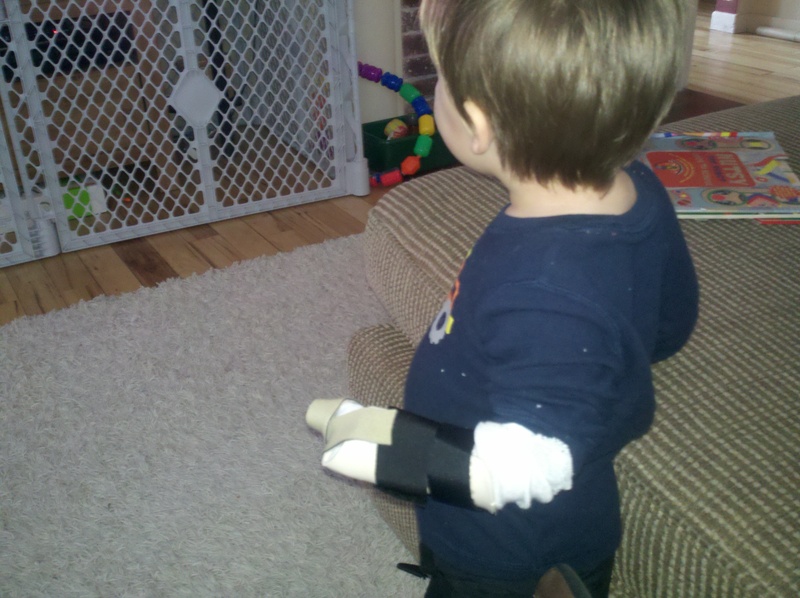 After six weeks, Jack got upgraded to a custom, velcro-on brace which was much smaller and stream-lined. I should note, the cast removal was by far my least favorite part of this whole thing, followed closely by getting the brace itself made. This was mostly because Jack was terrified of the saw used to remove the cast, his thumb hurt (as could be expected) and by the time the therapist had to look at his hand for the brace (and then have me immobilize his arm while they got it fitted) he was done with it ALL. It was the most fun. Or not. Since his 3-month post-op check we have returned to the doctor every six months just to make sure everything was moving along as planned. The growth plate from the bone that was moved to his thumb remains open which means it will continue to grow at the same rate as his hand and be proportionate with the rest of his body. His toe has a tendency to bruise when he runs around with bare feet, but this is normal as there is not a bone to stabilize the end of his toe to his foot. 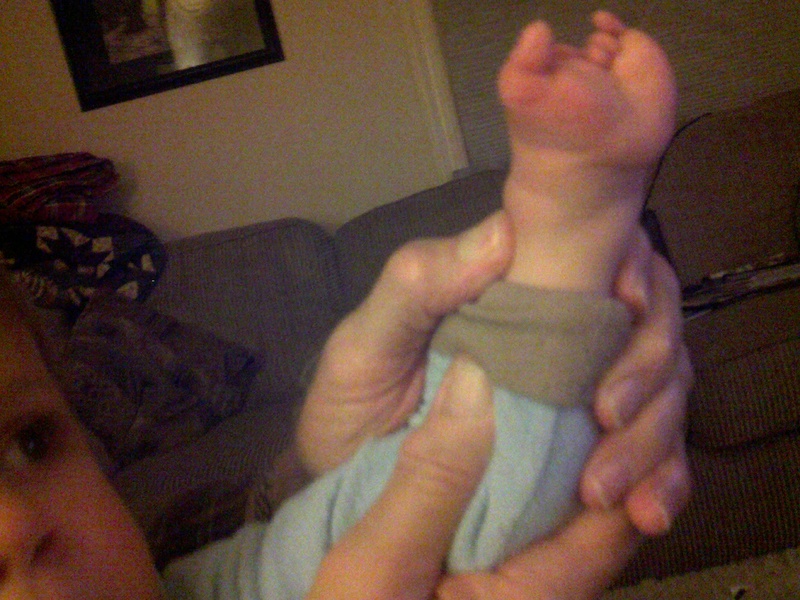 And that toe will always be shorter than the rest, but will grow with his feet (meaning it won’t stay two-year-old sized forever). At our final visit, our doctor had Jack squeeze his finger with his little hand and was very impressed with the strength of his grip, saying it was better than he would have hoped going into surgery as you just don’t know the final outcome when you are doing that type of surgery. I felt a whole lot of mama pride at that moment, so proud of my kid for having that surprisingly strong grip, but also knowing God gets all the glory for how things turn out. Other than a faint scar on the top of his thumb, you’d never know Jack has had surgery on his hand. And really, you’d almost never notice his little hand. As if I needed more proof of this, the night before his doctor’s visit, Jack used BOTH hands to do a full pull up on one of the arms of our elliptical – I see some monkey bars in his future. Do you have any doubt? Because I absolutely do not. The doctor mentioned that the only hardships we could expect to face with this would [likely] come as he starts school and kids are aware of his hand and ask questions and then in his teen years when all teens are struggling to just fit in and not be different or really stand out. I think that Jack’s perfectly suited to handle both this situations with a personality that you can’t help but love and a confidence you can’t help but admire. That’s our story, or at least one chapter, because I have a feeling the story is going to get better and better. Just you wait. 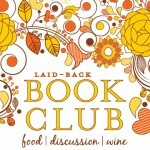 This entry was posted in Gratitude, Life in general, Music, Parenting, Symbrachydactyly. Bookmark the permalink. Thank you so much for sharing this story. 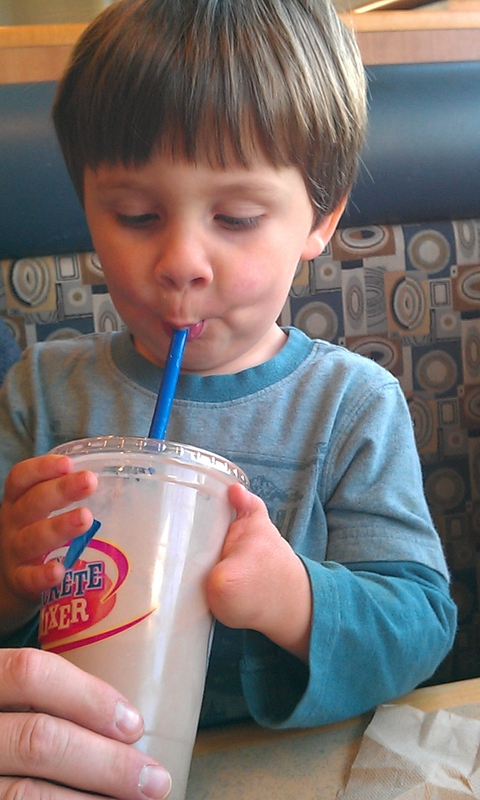 Seeing God at work in Jack’s life and in your parenting fills me with joy. Jack seems like a neat kid! My son, Lindsey, was born with symbrachydactyly also. He is currently 8 months old. It was wonderful to read your and Jack’s story; it really gives me hope. We haven’t started the surgical procedure, haven’t even gone in for surgical advisement, mainly because I became disenchanted with DMC Children’s Hospital, where he was born, because they misdiagnosed his condition as amniotic constriction band syndrome. Like you, I’m a Google researcher extraordinaire, and it took me about 15 minutes of researching to learn his true diagnosis. I also learned about a clinic at Children’s Hospital of Boston that specializes in symbrachydactyly surgeries. My little man is sheer perfection in my eyes and those of our entire family, but I do worry about how things will go when it’s time for school. I want him to love school like my other children do (and like I did way back when), but I fret about teasing or even just him having to constantly explain why his hand is the way it is. I know kids can be cruel, and I know that his father and I will have to steel him against it early. We just want our baby boy to have a happy childhood, you know? The way I figure it, your little guy is pre-k or kindergarten age right about now. I truly hope it has been or will be a positive experience for him and for you. All the blessings to you, your family, and of course adorable little Jack. And of course, any advice you might have would be very welcome.